Here you can see what the supplement capsules contain. 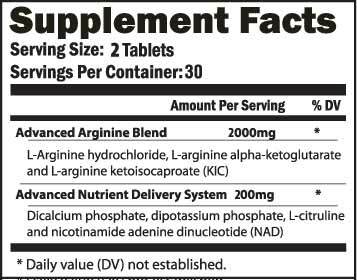 AAKG is a salt of the amino acid arginine and alpha-ketoglutaric acid. It is marketed as a body building supplement. The components are intermediates in the metabolism of nitric oxides. Alpha-ketoglutarate is a chemical found in the body. It is used for curing kidney disease; intestinal and stomach disorders, including bacterial infections; liver problems; cataracts; and recurring yeast infections. People take alpha-ketoglutarate to improve peak athletic performance and is an important addition to proper diet and training for the athlete who wants peak performance. This is based on studies that show extra ammonia in the body can combine with alpha-ketoglutarate to reduce problems associated with too much ammonia (ammonia toxicity). Used in conjunction with your exercise program, Xtreme Gain may support myodilation, the expansion of muscle tissue. is an amino acid complex naturally produced in the body when the amino acids ornithine and glutamine combine. Studies show supplemental OKG has muscle-building effects as well as potential to stave off muscle wasting. It offers an anabolic (muscle-building) and anti-catabolic (anti-muscle-wasting) effect by boosting IGF-1 (insulin growth factor) and GH (growth hormone) levels. Scientists state that OKG contributes to the synthesis of key metabolites, including glutamine, which is also integrally involved in supporting healthy immune functioning. Clinical studies have shown OKG supplementation to be effective in increasing protein synthesis, lowering protein catabolism, improving insulin and somatropin secretion and increasing absorption of amino acids and glucose to the muscles. It also supports healthy skin and tissue. is a chemical found in the body. It is a glutamine precursor that efficiently bypasses the digestive system for superior absorption and cell volumization. It is commonly used to help athletes optimise glutamine stores. Glutamine is essential for several bodily functions. It assists with blood sugar control and plays a major role in synthesizing muscle protein and cell volumizing. It is a primary source of energy for the immune system. XtremeGain© 2013. All rights reserved. This product should be used only as directed on the label. Consult with a physician before use if you have a serious medical condition or use prescription medications. A doctor's advice should be sought before using this and any supplemental dietary product. All trademarks and copyrights are the property of their respective owners and are not affiliated with nor do they endorse Xtreme Gain. This product is not intended to diagnose, treat, cure or prevent any disease. Individual muscle gain results will vary. By using this site you agree to all Terms & Conditions printed on this site.